My “story” starts nearly 30 years ago when I was first diagnosed with Crohns disease. It’s not something people can see or understand. The constant running to the bathroom, the restrictions on what you can and can’t eat, the pain, the medications and their side effects.Over the years, I had 3 operations, which has left me with Short bowel Syndrome, and I spent the next 8 years doing next to nothing, rarely leaving the house. That started to change when I met Rob online, then in late 2013 we moved from the UK to Cape Town. With Rob having such an outgoing, friendly personality, we met and made a lot of new friends, we were always being invited out. Then in July & August 2015 I went back to the UK to see my family, and whilst I was there we had a family photo-shoot. It wasn’t until September 2015 when I got back to SA and actually looked at the pictures, that I realised just how much weight I had put on. Two friends of mine told me about parkrun, “no way” I could even walk 5km I said, I haven’t done any form of exercise in over 30 years! 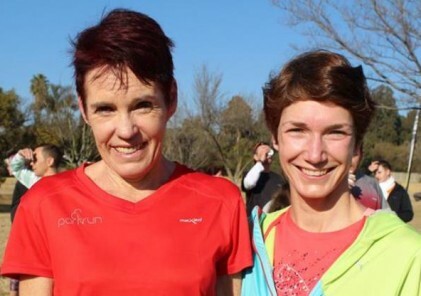 My friends persuaded me to try in and on 10th October 2015 I embarked on my parkrun journey at Big Bay parkrun. The route at that time didn’t worry me, I knew there were bathrooms along it and yes I walked that first parkrun with on of my friends in 51:39 – I was amazed I had made it let alone in that time. The volunteers that day were so amazing and encouraging that I knew I was going to come back. I got sick again so my real parkrun journey didn’t start until January 2016. Big Bay parkrun moved to the beach, it was hard a lot harder than the previous route and now because of the route I had to take medication to but now my sister in law and Rob had joined me so we kept at it. In April 2016 I can remember Pauline finally persuaded me to volunteer, I marshalled but it had to be close to the start in case I needed the bathroom. I think that was when the volunteer bug started to bite. On Freedom Day 2016, a group of us did 6 freedom parkruns, raising money for 2 local charities and I over the course of that day walked 30kms. This marked a real turning point for me, I could do more than 5km if i wanted to, so now I was going out in the week and walking or walk jogging regularly. Then one of my friends persuaded me to do a half marathon in Riebeek Kasteel and i actually finished it in just under 3 1/2 hours. 4 days later I did a 10km womens race in Cape town amazed that I could even walk 3 steps after the half marathon and finished that in just over 1 1/2 hours. At this point Century City parkrun had started and I was going there. I very quickly realised that they had issues with getting enough volunteers and started to volunteer there. The volunteering bug got a real grip on me, you would normally find me on the finish field (either in the funnel or at the scanning table) with a clip board in hand recruiting volunteers for future weeks. In December 2016, I was back in hospital, they had to remove 2 discs from my spine in my neck, replace them with spacers and put a plate over them. 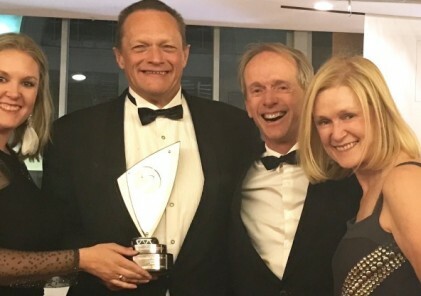 It was February 2017 when Alison finally got hold of me and we met up for some volunteer training – I was now Century City’s Volunteer Coordinator. Little did I know Alison was plotting my future with parkrun even back then. By now, I was losing weight, toning up, and had gone from doing no exercise to doing 30-40kms a week. 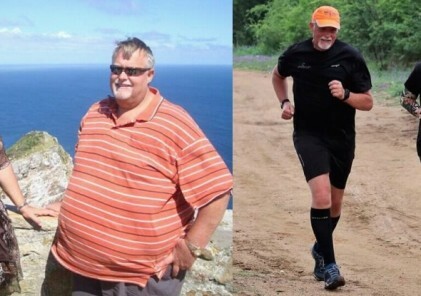 parkrun had made that possible for me. A friend of mine soon realised we were both approaching our 50th parkrun, we had to do it together so we plotted and planned and on 25th March 2017 we succeeded, it was an incredible feeling and I just could not believe I had done it. 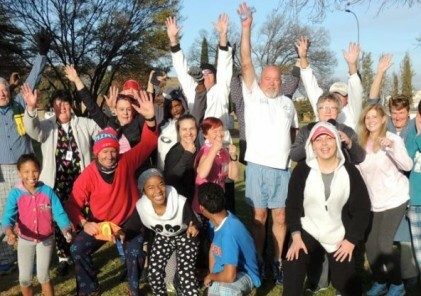 From that point on, parkrun was in my blood, I hated missing a weekend it the highlight of my week, I had new friends, I was getting fitter, I had lost just under 20kgs and Century City parkrun was beginning to feel like a family to me. On Easter weekend 2018 Century City parkrun had no Run Director. Alison told me I could do it, so I took on the role for the first time. We had a lot of fun that morning with the Easter bunny visiting and handing out Easter Eggs to the kids. My confidence in myself was beginning to return, now I am beginning to feel like my old self. When the Event Directors at Century City stepped aside, it effectively left Robert and myself to run Century City parkrun and we took over as Event Directors. I completed my 100th parkrun at Melkbosstrand, and had a great morning! In September 2018, I finished the 12km Peace Trail up and down signal hill, it took me just under 3 hrs but I did it, and a lot of my training took place on trail parkruns. Alison approached Robert and myself to become parkrun ambassadors. For me just that request was such an honour and showed me that even when my confidence in myself was low, others had confidence in me. If I had to summarise what parkrun has done for me. In 3 1/2 years, I have now lost over 20 kgs, I’m fitter, it gave me a love for trail “running”, it has shown me that I don’t need to be competitive to win, I will never be a runner, but I’m OK with that, winning for me is just taking part and finishing what I started out to do. parkrun has shown me the beauty of this country, and it’s given me my confidence in myself back. My friends tell me I’ve changed, they tell me that now, they see what they think is the real me, someone who is confident in themselves and their abilities. I’ve learnt through parkrun, that although my Crohns and resulting hidden disabilities will never go away and I will always be on large amounts of medications, I can do things that I would never have dreamed of ever doing, I just have to maybe work harder and plan better to overcome them. Thank you so much for starting parkrun in South Africa. I have always been “small” but circumstance of life made me barely able to walk my first parkrun a year ago and I now do a 31 minute or so time. 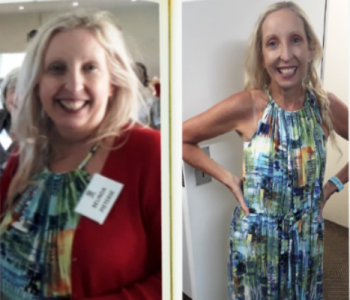 I lost 17kg’s with eating healthy and running which all started with a desire to change my life which resulted in me trying parkrun. 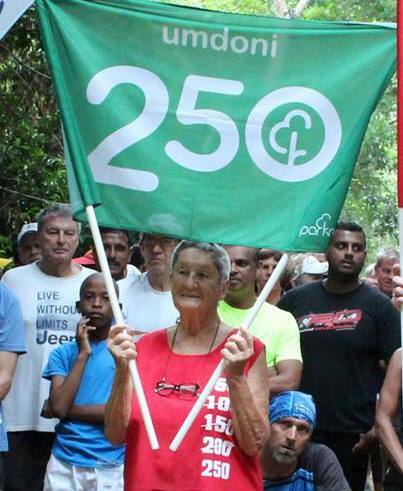 Joey Grove, at 82, achieved her 250th run on 2nd March 2019, at Umdoni parkrun. A grandmother to 7 grand children, Joey ran her first parkrun in 2013 and being an avid walker and has taken her 5 years and 8 months to get to her 250th run.